I finally made it around to thumbing through all the sub-topics and was suprised to see somebody else using this stitch, I used that stitching to awhile ago to solve a problem with some of my interior pieces that I have been making when I havent been able to get out side and work on my car. My problem was the spray adhesive wasnt holding my vinyl to my covers and the design I layed agaist it and everytime it sat for awhile it would pull away flat plus the vinyl I bought was to thick for my application so I came up with a solution to my problem instead of starting over and making new pieces. This stitch can be used to solve multiple problems. Vinyl soaks up a lot more contact cement than the (closed cell foam) padding. If you're applying the adhesive with a brush, it's hard to work quickly and hard to get an even coating. Then, with some of the applied adhesive a little too dry and some of it a little to wet, when you try to apply the vinyl to your part, getting a smooth application is even trickier than it ought to be. A heat gun helps with rushing an area to the dry-enough stage. If adhesive gets too dry, you have to carefully apply just a little more. I ended up using up my quart of cement, so I'll have to buy more. I'm also thinking of investing in a spray gun for the transmission tunnel (and any future parts.) So, I didn't end up with as even a stretch as I wanted and there are one or two small wrinkles in the vinyl, but not too bad. In the small but deeply concave areas on both sides of the parking brake lever, I added stitches right away because I was concerned the contact cement might pull loose. Generally though, I think the vinyl looked "tighter" an hour after application than it did right away. The padding feels pretty luxurious. I cut some of my darts too deeply. I need to be more careful next time. Maybe I should punch round holes somehow and just snip up to them. You can see in the photos that I have a LOT of stitches on this part. My theory was that the stitches should hold the vinyl tight over the whole part even if the contact cement were to totally fail sometime in the future. Two needles passed through each of the 500 holes I pre-drilled in the fiberglass, so by my count that's 1000 stitches. That said, the stitching went remarkably quickly. You can't put a stitch out of line or in the wrong place if the wholes are drilled in straight rows. Incidentally, I drilled 5/64" holes on 5/16" centers over the hole part. On my test piece I had drilled 1/16" holes, but they were too tight for comfortable hand stitching with the needles I had selected. In retrospect, I'm really glad I decided to stick to one hole spacing everywhere because it helped me find the holes and establish a rhythm. Oh, BTW, I really really like the pre-waxed nylon thread I got from Tandy for this project. That really looks good, should be a nice addition to your cars interior. Curtis, looking very good , I think everyone will be learning something from your experience. I have used weldwood HHR with great result. Brushing works best for me. 3m has not worked well for me. My transmission tunnel trim project is pretty much complete now - except I'll add an aluminum wear plate next to my throttle pedal to overlap, clamp down, and protect the vinyl from wear. What have I learned since my last post? Contact cement is easier to apply with a paint gun, and when you spray it on you use less cement. The guys at S&S Upholstery here in Longmont tell me that they leave contact cement in their gun year round, and it never clogs or needs to be cleaned out. S&S also advised that any "bubbles" in my vinyl application would likely disappear when the part gets hot. "Just leave it in the sun for a little while." Sure enough! Their tip on darts is just to cut them less deeply and rely instead/more on the stretchiness of the vinyl. Darts on my second part turned out much better than on my first part. In fact, the whole part turned out a little neater. My vinyl stretching team is practiced now. We're three people: myself, my wife, and our dear neighbor Justine who lives across our back alley from us. The application needs to be divided into reasonable size segments. We start by test-stretching the vinyl over the fiberglass part to see where they will need adhesive, and marking the back side of the vinyl with Sharpie. Then we mask and apply contact cement to the matching surfaces. Suppose the segment we're doing is triangular except that it wraps over a radiused edge... one side of the triangle gets lined up as a starting point. Then, one person is responsible for holding all the excess vinyl up (because it will GRAB if it's given the chance). A second person presses vinyl down against the fiberglass (and landau pad) bit by bit, working across the triangle. The third person's job is to tug and stretch the vinyl as necessary. Avoid using any sort of clamp at all; in this project they weren't necessary and the one or two places I tried to use them just gave me crushed areas that were slow to rise back up. So now I'm thinking about door panels. Before I dive into that, I'm scheming about ways to trim around the door latches (instead of using MG's plastic trim pieces), about more robust door pulls, about custom window crank handles, and about recontouring the door cap rails a half inch taller so they better hide the window seal and clips from view and also make it more comfortable for me to rest my arm when the window is down. There are some chromed metal door pulls that are quite sturdy, I have them in my car. Must have come from the '67. Now that I've had time to think about it, I'm leaning toward simply building a minimalist door pull feature into the new door caps. Just some sort of dent you can get your finger tips into. I took one of the old door caps off to have a look. I'd forgotten how dense they are. Replacing them with hollow or foam filled caps might almost be enough to offset the weight of upholstering the door cards. I've been thinking about stitch patterns. Is this too much? You better be careful, you may have to tie the car down if it gets breezy. I got a long way to go! I saw a magazine article the other day about Volkswagen's GTI model. The article mentioned how light the first-gen GTI was. At 1945 pounds, it was about four hundred pounds lighter than a contemporary MGB roadster. Wow. Looks really good! Here is my door panels that I have made for my car, I really like the idea of fiberglassing them to save on weight. Nice! I like the way you've carried the theme from panel to panel. I ordered a mess of plastic clips from Moss the other day. I'm curious to see how well they'll work with panels that are much thinner than usual. Following up, I've molded a pair of custom door caps out of fiberglass. They're not as light as they could possibly be, but they'll work. Caps and cards are pre-drilled and are ready to cover with foam and vinyl. This project is taking too long! Curtis, I probably missed it somewhere,,, but what kind of sewing machine are you using ?? 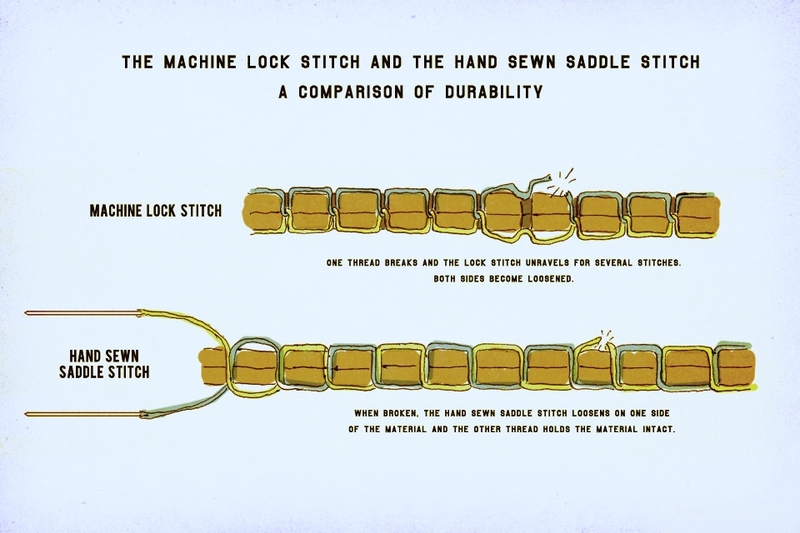 Over 1000 stitches per door panel, all hand-stitched by two-needle saddle stitch method. I finished and installed the passenger door panel today, only to discover the door lock on that side would no longer latch. Lisa said she'd prefer her door to be latched while we're driving around Colorado Springs this week, so for the time being I adjusted the striker plate outward. Might rethink that after the meet. Covering the door caps will have to wait too.